Don’t try this at home. Really. True story: before I wrote this book, I was a professional prototype vehicle test driver. So when I set out to write about the Four Horsemen of the Apocalypse tearing up the highways in Christine-ish muscle cars, you can bet I had fun with it. Check out this interview on MyLifeMyBooksMyEscape where I not only talk about cars, I also go pretty deep into the cool quirks of my characters, and what exactly Dru’s universe (or the “Druniverse”) is really like. Plus, I share some cool insights about the “magic” properties of crystals (including how the pharaohs of ancient Egypt used to protect themselves against the evil eye). 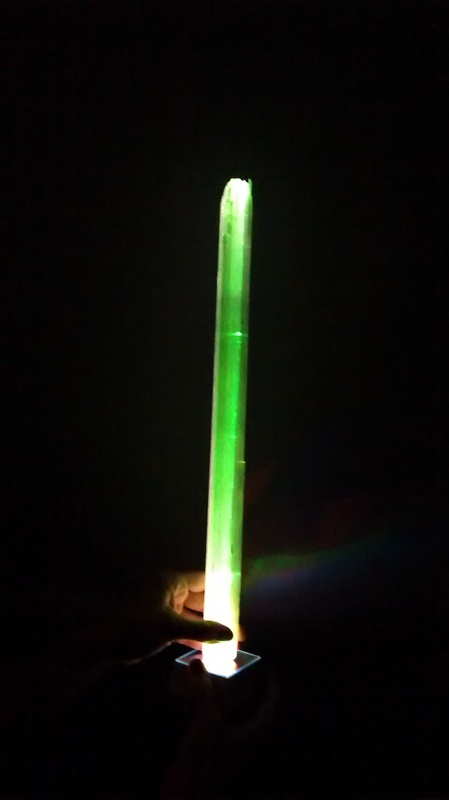 Until we get lightsabers, here’s the next best thing. In my book, Dru fights demons and creatures using magical crystals. Here’s what’s cool: all of the crystals she uses are magically charged versions of actual, real-life crystals: quartz, amethyst, galena, pyrite, etc. Being a writer who writes about crystals, I’ve naturally built up a modest collection of crystals over the years. The towns in the Rocky Mountains are rife with rock shops and lapidaries, some of them little more than a room in someone’s house. If you know where to look, you can find some pretty cool stuff. Here’s a picture of my biggest crystal find yet: a natural selenite wand. Because of its mineral structure, selenite is fiber-optic, which my lovely wife is demonstrating here with LED lights. In the books, this wand belongs to Dru’s ultimate nemesis, an evil crystal sorceress bent on destroying the world. Fun stuff! Especially because, hidden in the between all the fancy magic, there’s a little bit of science. Neat-o. Last Chance: Win a Crystal! 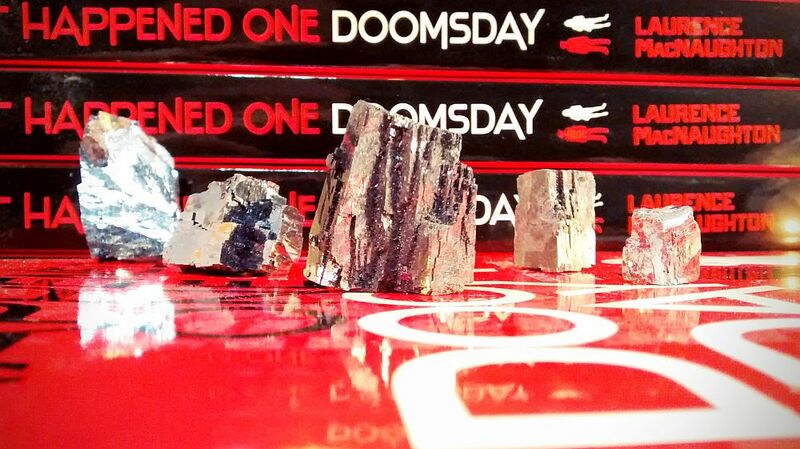 Today is your last chance to win a genuine galena crystal like the one Dru uses to battle demons in IT HAPPENED ONE DOOMSDAY. These precious-metal crystals (containing up to 2% silver) are reputed to ward off supernatural forces, and have been prized for thousands of years. They were even used to line the eyes of the pharaohs in ancient Egypt. Now, you could win your very own galena crystal. To enter to win, just subscribe to my author newsletter. Click here. After a moment’s consideration, Dru picked up a shiny chunk of galena. 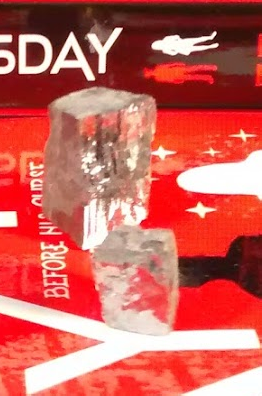 Like most galena crystals, it looked like it had been formed from a half-dozen different little cubes all fused together, and it had a dark mirror-like sheen, like a highway patrolman’s sunglasses. Greyson put his arm on the counter, and she pushed back the sleeve of his leather jacket. When she touched the galena to his wrist, the crystal popped with a cold blue flare of light, like an old-fashioned photo flash, accompanied by a sinister sizzling sound. Greyson yanked his arm off the counter and sucked his breath in through his teeth. To enter to win your own galena crystal, just subscribe to my author newsletter. Click here. Book signing + “magic” crystals = awesome! Generally, Friday the 13th is not considered a warm-fuzzy day. However, Saturday the 13th is awesome! Especially when you get to meet an author (such as Yours Truly) . . . pick up a new autographed book . . . and get a chance to see all the real-life crystals described in It Happened One Doomsday! You could win your own demon-fighting crystal. Seriously! Science: galena is a natural mineral form of lead sulfide. Magic: galena fights demons. Nuff said! In my new book, Dru uses all sorts of magic crystals to fight the forces of darkness. Take galena, for example. Scientifically speaking, it’s a lead ore with a low melting point. It also contains up to 2% silver. But from a spiritual standpoint, it was used in ancient Egypt to line the eyes of the pharaohs. Possibly it was intended to give them second sight, possibly to protect against evil curses. In my book, Dru uses it to fight demons. 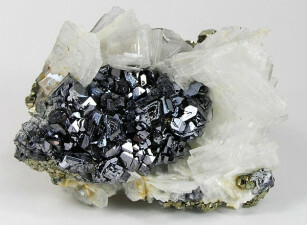 Most galena crystals in the U.S. are mined in Missouri (galena ore has mostly industrial applications). I was recently talking to a guy who had retrieved some great crystals from a Missouri mine. Apparently, there was so much groundwater in the rock that it dripped everywhere, constantly. They had to rig up corrugated steel on scaffolding inside the mine shaft to form a roof for the workers and equipment. Like it was raining underground. Anyway, I have only a few of these galena crystals to give away. But one of them could be yours! Selenite is naturally fiberoptic. See? There’s science in my book, too! This Saturday, come meet me at Barnes & Noble in Glendale. Then stay for all the Harry Potter excitement! Besides signing books, I’ll also have a live demo of the actual crystals Dru uses in the book to fight demons and other creatures of darkness. Galena, pyrite, selenite, amethyst, and tons more. Dan even signed the skull for me. How cool is that? A few years ago, on a placid summer evening resonant with cicadas, I stepped out to buy a bottle of wine for my wife’s show at an art gallery. 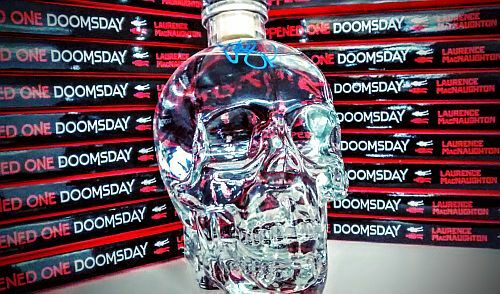 And there, in the corner of the store, sat Dan Aykroyd, promoting his new Crystal Head Vodka. You may not know this (I certainly didn’t at the time), but Dan is a big believer in paranormal phenomena. In fact, his family has a long tradition of investigating the paranormal. Win a “magic crystal” at The BiblioSanctum! Want to win your very own galena crystal, with purported anti-demon magic? Read on. In my new book, IT HAPPENED ONE DOOMSDAY, I wanted to create an utterly unique system of magic. By chance, I had a conversation with Dan Aykroyd from Ghostbusters, who’s a big believer in the metaphysical properties of crystals.